I’d like to comment on the student fees business, but I can’t because I’m too cross to do it reasonably. Try Martin’s post instead. Here’s something different for Friday afternoon. Does it make sense for two people from the same group to submit bids for funding to the same call? Conventional wisdom says no – you don’t want to compete against yourselves. But I’m not convinced. I reckon putting two bids in increases the chances that the group will get some money from the call. Probably slightly less than double the chance, but still significantly more than putting in just one of them. Let’s do some toy sums. 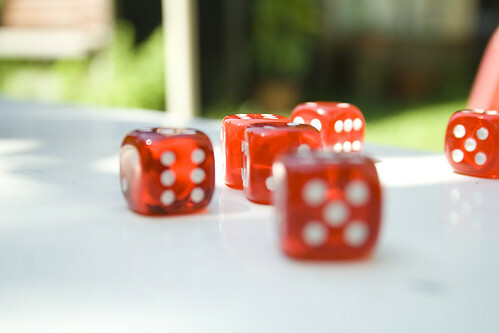 Assume for modelling purposes that whether a bid is funded or not is purely random – say 1/6, like rolling a six on a die. (I know, I know: we all know that securing funding is absolutely nothing like a random process.) Submitting one bid gives you a 17% chance that the group gets cash. 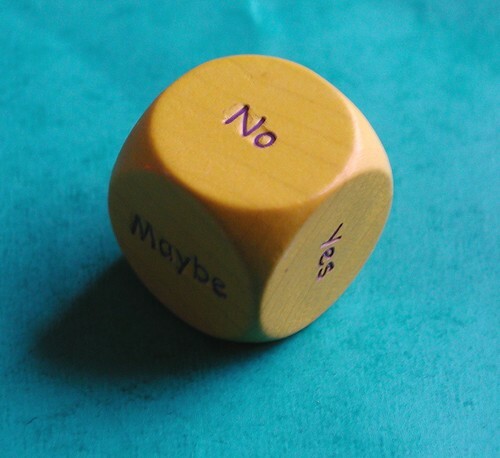 What happens if you submit two dice – or roll two bids? 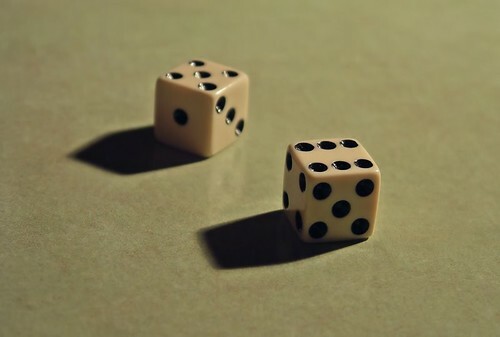 The Wrong Answer is to assume that the probabilities add, and that the chances are therefore 34%. You can tell this is wrong, because it implies that if you submitted six bids you would definitely get funding. Anyone who’s sat miserably through seemingly endless rounds of failing to get started in Ludo knows that it’s not certain that you’ll roll a six given six tries. The Proper Answer is to use the binomial distribution, but you can also do it by working through the possibilities. There are 6 x 6 = 36 possible combinations of the two dice. Of those, 6 have a six on the first die (6:6, 6:5, 6:4, 6:3, 6:2, 6:1), and 6 have a six on the second die. But we mustn’t double-count double-six, so there are 11 out of 36 chances to get at least one six, or about 31%. Now, it could be that there’s no way that the funders will award two grants in one call to the same group. That would mean we can’t count double-six at all, and the chances reduce to 10 out of 36, or 28%. That’s still way better than a single bid. Obviously, if you can send the bids to different funders, so much the better. Except that on this analysis you might as well send both to both. Journals are usually pretty strict about demanding a promise that you’re not submitting substantially the same manuscript for consideration to any other journals at the same time. (I know, I know: we all know that whether a paper gets accepted or not is even less like a random process.) But the rules about submitting bids are often less strict. You need to be a bit careful that you’re not setting yourself up for conflicting commitments if you win both, of course. So: two bids are better than one. Much like heads, as my colleague Will Woods pointed out. Heads, tails … I know, I know: we all know that getting bids and papers in is absolutely nothing like tossing lots of coins and hoping for heads. I taught my students probability of multiple events this semester and I’m redoing it next semester. Glad to be a teaching resource by accident! I really don’t know whether the distribution is skewed or not. It is something that gets easier the more you do, so you’d expect that there’s a practice effect going on. (The more bids you prepare, the better you get at preparing them, so the better your chances are with each successive bid.) But on the other hand, the number of applicants is growing, and funding is generally going down, so average success rates over time have been falling. The trouble here is that the answer isn’t maths. The right question is “how likely is that that a funding organisation will notice two competing bids from the same group and thus mark both down as unprofessional”. I’d say it’s high enough to outweigh the straight benefit you calculate above, but working it out isn’t amenable to maths.